Reports by Rick Perkins, Jason Rickards, Ben Schooling, Dan Kilsby, Bruce Keen, Jamie Hilton & George Hand, Andy Peake and Dan Vincent. Fifty-six Musto Skiffs descended upon Castle Cove Sailing Club for their 2018 Nationals. 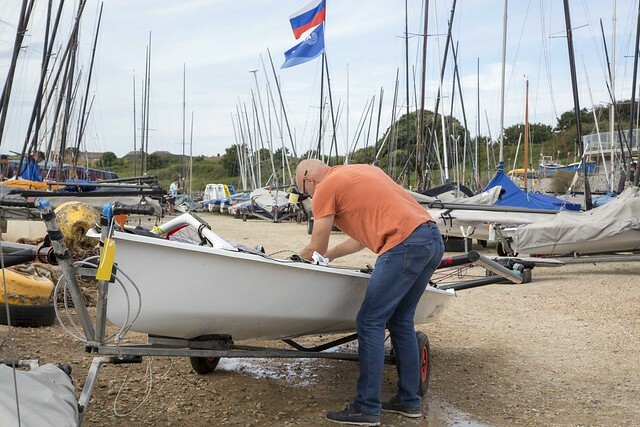 With sunshine and and a great forecast for the event, the fleet were raring to get on the water for some close racing inside Weymouth harbour. Racing started on time in a 12-15kt Westerly. In race one the fleet split up the first beat but converged at the top mark with no clear side paying. Andy Peake found himself in front, closely followed by Jono Shelly. Jono passed Andy down the first run but Andy returned the favour down the last. Sadly for both of them, Andy Tarboton had hit the right hand corner up the last beat and passed them both. Race one finishing order, Andy T, Andy P and Jono. Race two once again showed the strength of the fleet. The wind had shifted 20 degrees right and thus evened up the course. The usual suspects made their way up the fleet to battle it out and keeping ones head out the boat seemed to reward the effort. Bruce found his form after a slow start to take the bullet from Neil Ashby with Andy Tarboton in 3rd. There was a pin-end bias to the start line of the third race, and Andy Rice performed his traditional port flyer, along with upwind animal, Neil Ashby. Three laps later Ashby was still in the lead going round the final windward mark, but was struggling to shake Bruce Keen and Dan Vincent off his tail. As they scorched downwind there was little room between them, but Vincent won the gybing battle to steal the victory and win his first Musto Nationals race for ten years and one we will never hear the end of. Tonight the clubs have hosted a fine chilli dinner with tasty chocolate brownies for afters. Now the fleet are enjoying the subsidised beer and are in the middle of a tinfoil boat building competition. Big thanks to the excellent efforts of our hosts Castle Cove Sailing Club. Today started with the Musto fleet watching the Aeros going out in search of a Bounty, although in 25 knots it was no Picnic, and many got in a Twirl while trying to get a Boost downwind. Anyway back on Topic, our Race Officer, who isn't at all Flake-y decided to keep the Musto fleet onshore as he thought you would have to be Fruit and Nuts to launch in those conditions and the forecast was much better After Eight. In the end the wind did not moderate quickly enough, racing was cancelled and the fleet convened for an experts panel forum, led by Russ Clark ably assisted by Dan Trotter, Andy Tarboton, Bruce Keen and the aptly named Ben Schooling, who managed to share their pearls of wisdom with the grateful fleet and apparently the whole thing can be re-enjoyed on Facebook Live. The fleet has been split into Gold, Silver and Bronze fleets and everyone has been teamed up with Buddies in readiness for the next two days of racing, which promise to be EPIC. Tonight the fleet has enjoyed a fish and chip supper and is now doing battle in a skittle competition. Tomorrow the forecast looks promising and the fleet are primed to enjoy four races. Day 3 dawned wet and breezy and the fleet set off enthusiastically into the bay for a big day on the water! The first race started in 10-15 knots and a rolling, but confused sea state. Dan Kilsby and Andy Peake lead around the windward mark having worked up the left hand side of the course. An extra layer of excitement/ distraction was added to proceedings as the fleet was visited by a 8 foot Porbeagle Shark, sniffing around for swimmers! Kilsby escaped unscathed to take the win, closely followed by Bruce Keen and birthday boy Jamie Hilton. With the wind against the tide the fleet was pushing the start line hard for the second race of the day. On the second attempted start the fleet got away with a few pileups at the committee boat. Hilton was first to the top mark, but lost the lead when he gybed and went for a swim. Keen and Peake gained downwind by going all the way to the port layline, followed closely by Andy Rice. Keen eventually took the win, followed by Vincent who timed his gybe for the shift on the last downwind perfectly and snuck past the chasing pack. Andy Rice smashed it up the first beat from the port end heading out fast on starboard with his plate raised in a building breeze and an increasingly lumpier sea. Hilton in fine form, and class legend Nigel Wallbank led the chasing pack. Come the leeward Rice rounded well clear of Hilton and unfortunately for Nigel he had a brush with the mark leaving him with a spin. Hilton narrowed the gap by the top mark and took the lead on the hoist with Andy slowing to sort his knitting. Hilton took the win for a Birthday Bullet, and the first to break the Stokes Bay stranglehold on race wins. Andy took second with Schooling taking a solid third. Race 4 started with the fleet clocking on to the fact that whatever happens, just go Left. Even if everything suggests otherwise, just go left. Our illustrious leader Bruce was led around the course by George Hand, who, with Bruce had secured the pin end of the line for the go left gain feature. Bruce managed to overhaul George on the final beat to the finish and take the bullet. George grumpily finished in 2nd and Andrew Peake taking a solid 3rd. Tonight the fleet have enjoyed a BBQ and are now involved in full sized hungry hippos. Race 8 and it was breeze on, race committee had brought the start forward from 10.30am to 10.00 am so we have seen some blurry eyed people this morning. By the time the gun went for the first we were touching 24 knots so it was a little fruity. Jason Rickards got buried at the start which forced his hand to bang on to port and was electric upwind, and pulled out a big lead on Bruce and George which he held until the last gybe on the last lap, making a ballsy move to ignore Dan Kilsby's shout of starboard, therefore clinching the win. Race 9 and the breeze had shifted under Portland and gusts increased to 27kts. The fleet split with the left side paying and Kilsby led from Shelley and Peake. George Hand showed great pace to pull through to 3rd with Kilsby taking the bullet from Shelley. By the final race the wind had shifted further right meaning the windward mark was placed under the cruise ship creating an exciting approach. The gusts were rolling down Portland and hitting the water in angry bursts peaking at 33kts. A war of attrition ensued with Bruce Keen rounding out his excellent series with another bullet from a flying Jono Shelley and George Hand rounding out the top three. After a fantastic series, congratulations go to Bruce Keen for becoming National Champion. The podium was a Stokes Bay shoot out with George Hand having a great day to pull up to 2nd and Dan Kilsby following suit in 3rd. As well as the top positions the fleet also operates age group competitions as well as silver and bronze fleets. Youths was won by Andrew Strickland, Masters by Dan Vincent, Grand Masters by Sergei Samus and Legends by John Evans. Silver fleet was won by David Annan and Bronze by Andrew Stickland. A huge thanks to Castle Cove SC for a superb 10 race event with a special mention to Lorna Graham and her team for a fantastic effort. Also thank you to event Sponsors Harken and St. Austell Brewery for the Tribute beer and to the class sponsor Musto.